Removal of cataracts has been practiced for centuries, but one of the problems after surgery, has been how to focus the image on the retina. During cataract surgery the lens of the eye is removed. With the clouded lens removed the light can now get into the eye but it is blurred and not focused. Prior to the invention of Dr. Harold Ridley in 1949, the only solution was to wear "coke bottle" glasses. 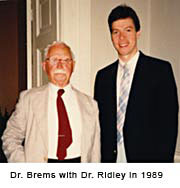 Dr. Ridley was as ophthalmic surgeon in London, England. During WWII Dr. Ridley had experience in treating British fliers who had sustained injuries when fragments of cockpit canopies penetrated their eyes. These canopies were made from a plastic called polymethyl methacrylate (PMMA). Dr. Ridley had observed this plastic appeared to be inert when it lied within the eye. He fabricated a lens made from PMMA to be used to replace the human lens during cataract surgery. This intraocular lens (IOL) was first used on November 19, 1949, during cataract surgery on a 45-year-old woman. Over the course of the next several years he performed cataract surgery and implanted about 1000 similar IOL´s. Dr. Ridley's development was met with skepticism and scorn. A hugh backlash against Dr. Ridley´s invention and procedure by many of his peers occurred and resulted in the slow adoption and further development until the mid-1970´s. Since its inception, the IOL has benefited well over 100 million cataract patients worldwide. Surgeons implant more than 8 million IOL´s each year. Dr. Harold Ridley was finally recognized for his contribution to humanity and was Knighted in London by Queen Elizabeth II on February 9, 2000 one year prior to his death. 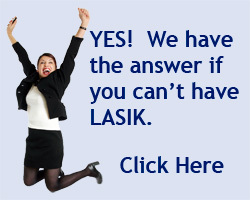 With current cataract surgery techniques and IOL´s we are able to restore a patients vision and at the same time reduce or eliminate the need for glasses because of what Dr. Ridley started. Cataracts are a problem the have interfered with humans since the beginning of recorded history. Ancient cataract surgical instruments have been uncovered in Egyptian tombs. Cataract operations are among the oldest recorded surgical procedures; there are references to cataract surgery in the Code of Hammurabi in 1750 B.C. In the ancient world, lenses damaged by cataracts were dislocated rather than removed from the eye. The surgeon used a lance to push the clouded lens backward into the vitreous body of the eye. This operation, known as couching, was standard practice until the mid-eighteenth century.